The character I met is a stuntman and extra for the show Game of Thrones (GOT), Damian is a fantastic tour director of the set locations for the GOT tours. The reason he’s a tour director is because he has to supplement his income in between the show somehow. What better way than to keep his interest up in working for GOT than by telling the fans of the show all about GOT in detail. He showed us around all of the beautiful scenery and locations where they filmed and are going to film. He even showed us a Castle that he knew they’ve been scouting out the location and thinking about for future episodes. He knows a lot of the cast personally and is even a drinking buddy with some of them. He was able to call a buddy in Stranford, that is the trainer of the Direwolves. 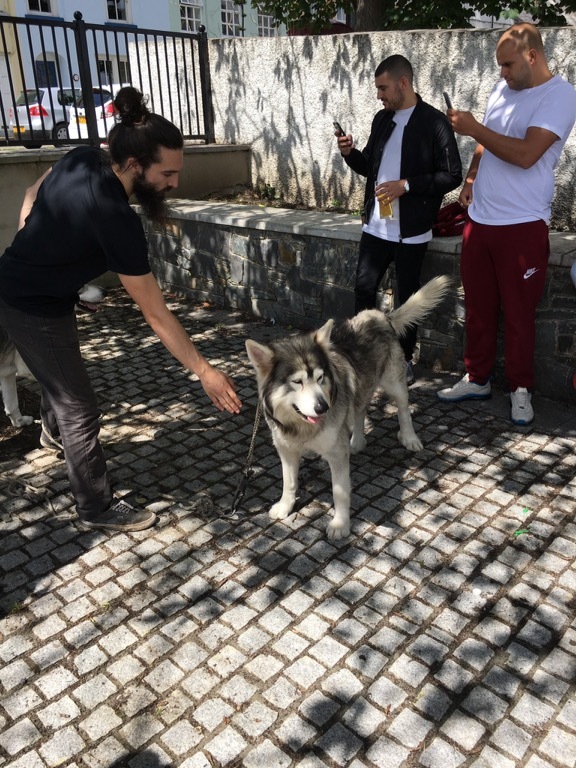 This trainer met us in Stranford and we met the dogs that pose as Direwolves from the show. He said he likes to include that as an extra treat but not to promise it to friends that may decide to take the tour in the future. Along with this fantastic extra, was the fact that one of Damion’s stunt talents was fencing. He showed us some techniques for making it looked like you got stabbed, or stab someone. This hut is located right next to a Castle named Dundrum Castle. Since our weather was cooperative, he took us to the Castle as an extra. In the back of the bus he pulled out costumes that we got to try on. We walked up the hill to the sword maker’s hut. Then we posed for pictures with the swords and props that this extra had. One other highlight of the tour was taking a ferry over to Stranford, a beautiful picturesque waterfront village. We ate at the Cuan Restaurant. A beautiful restaurant owned for 25 years by a lovely couple, that introduced themselves and asked if we enjoyed our meal. Which was comparable to a gourmet dinner back home in Maryland, in presentation, but not in price. I have the card for the fellow, but if you make plans his name is Damion and he does the Winterfell Tour out of Belfast. ← The Waitress that Bailed.